Virginia Public Schools Using SOL’s to Indoctrinate Children in Islamic Theology and Purge Christianity – Part I | Virginia Right! We posted an article on this topic a couple of months back, and thanks to a number of people that helped look into this. And the Mechanicsville Tea Party played a role in initially exposing this agenda and bringing it to Virginia Right’s attention. It is safe to say that Virginia Schools have hijacked the Virginia Standards of Learning as a tool to indoctrinate our children in the wonders of Islam to the near exclusion of Christianity. In fact, the great Christian Purge is alive and well and one need look no further than the first page of the 2008 Strikethrough Version History & Social Science Curriculum Framework to see the Virginia brand of Selective Secularism rear it’s ugly head. For the uninitiated, “Selective Secularism” is the train of thought that all religion must be purged from any public document except Islam, as we wouldn’t want to offend the followers of Muhammad. And Islam is due a dose of Affirmative Action because people thought ill of Muslims because 19 of them hijacked some airplanes and killed a lot of Americans in the name of Allah. But a bit of animosity towards Islam would have to be expected, that is just human nature. And we all know that there are Muslims that are good and descent people. Americans. And generalized hatred of any religion for the actions of a few is simply wrong. And to be clear, the villain here is not Islam or Muslims. The villain is the Virginia Department of Education and the misguided thinking that has gone into the creation of the Virginia Standards of Learning. This is the first of a three part series exposing the radical agenda of the Virginia Department of Education and their efforts to revise history to suit their liberal agenda and promote Islam through the Virginia Standards of Learning. This type of agenda driven education is not new. But it has accelerated to the point we must put a stop to this in favor of an honest and true view of history, and not one tainted through the prism of the left wing spin we have uncovered. Part I deals with the promotion of Islam and the purging of Christianity. Part II exposes the revisionism and pro government control agenda that has seeped it’s way into Virginia’s schools, and the third part is a conclusion and call to action. The very first page of the 2008 Strikethrough Version History & Social Science Curriculum Framework sets the tone for the rest of the document. The wonderful thing about a strikethrough version is that you can easily see what the document writers were thinking when they made the changes. The first victim was Christ as A.D. was changed to C.E. (Anno Domini > Common Era). In the Year of our Lord is now the Common Era. And B.C. – Before Christ is now B.C.E. or Before Common Era. This as nothing more than politically correct nonsense. This is a “bullet point analysis” put together by the researchers. The pro-Islamic discrimination in our public school texts favors Islam in secular schools, revises history and obscures Sharia law including treatment of non-Muslims. Students are not exposed to fundamental Islam’s goal of imposing Sharia law on all peoples and suppressing all other religions. Chapter 3 section, “Origins of Judaism”, Chapter 6 section “Early Christianity” and Chapter 10 in entirety “The Muslim World. Text length: Origins of Judaism, 8 pages, Early Christianity 6 pages, The Muslim World, 22 pages. These are but a few examples indicative of pro-Islamic discrimination throughout this text, its sequel on Modern World History, and comparable high school history texts of mainstream publishers adopted across America. The supplemental study guides of the Virginia Department of Education re-enforce the texts instead of correcting them. replaced with “C.E.” (Christian Era, the term used by Muslims) with a population of less then 2 mil (CIA 2009 World Fact Book). Is this what Virginians want? Is this the kind of disinformation our schools should be teaching? There are serious consequences for our Constitution when Islamic fundamentalists in this country are calling for a parallel legal system or special dispensations for Muslims in public schools, workplaces, and taxpayer funded facilities. 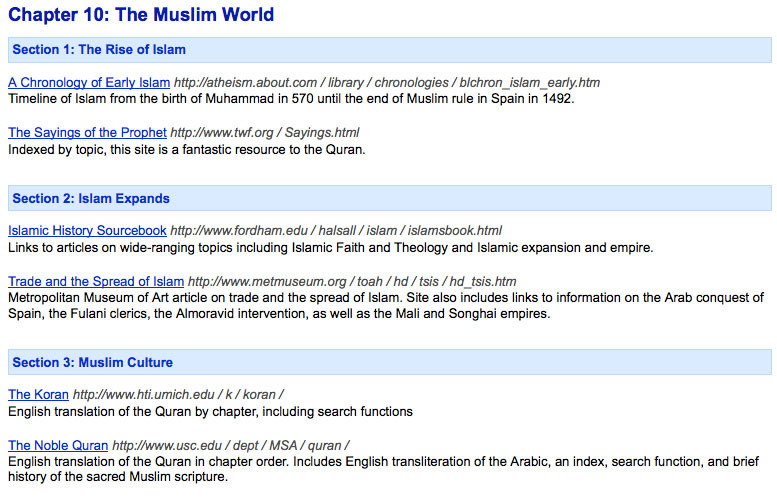 The textbooks don’t begin to teach the whole truth about Islam. We need to hold the State Department of Education accountable. Footnote: Strive The word Allah used in Arabic is: wa Jaahada Fee Sabeelillah – meaning: made Jihad in the path of Allah. It is incorrect to translate the word Jihad to mean strive/striving because Jihad is a legal terminology with a specific meaning, and that is, fighting in the path of Allah and the struggle therein. Translating the word Jihad to mean ‘Striving’ is misleading as it gives a meaning different to the intending meaning in the verse. Unfortunately, this error has become a common practice amongst the translators, so let them be careful from falling into such errors. So, how does the quantity of information taught on Christianity and Islam differ? And what does the Virginia Department of Education want our children to know about Islam? A couple of points, like with Christianity? Apparently, Christian Culture is not important. This is an in depth look at the history and teachings of Islam, Mohammad, the “Noble” Quran complete with a play by play of everything you ever wanted to know about Islam but were prohibited from learning in school by the United States Constitution. And if I recall that long forgotten religion called Christianity, there was some fellow called Jesus and a book called the Bible. This gives nothing but a passing mention of Christianity and reads like a Theological study in Islam. This is absolutely shameful and unconstitutional! Most Christians as well as Muslims would probably be far happier of the State Controlled School System simply deleted both of these sections and let the parents decide which Mosque or Church (or Temple or Synagog) their children should receive religious training. Below are the documents where a lot of this information came from. This first one is a copy of the teacher’s workbook. Feel free to browse through and see for yourself what Virginia’s children are being asked to accept as history. This is the Strikethrough version of the changes to the latest version of SOL’s for Virginia’s Schools. This is examined in the second part of this series. This is an outrage….Do you know that the two largest pulishers and distribitors of school text books in the USA are owned by the Saudi's………………. No wonder our education is been raped!!!! Would you please put the names and address's of these companies because we don't need them here any longer! Carole: Do you have any links and/or info regarding the ownership of those two largest publishers/distributors being Saudi owned? I'd like more info regarding the matter.